Published April 18, 2014 at 1625 × 1080 in Contentedness embodied (Part Two)	~ Post a comment or leave a trackback: Trackback URL. Many thanks to Steve Evans for this delightful and engaging image. What a beautiful photo of these two women. 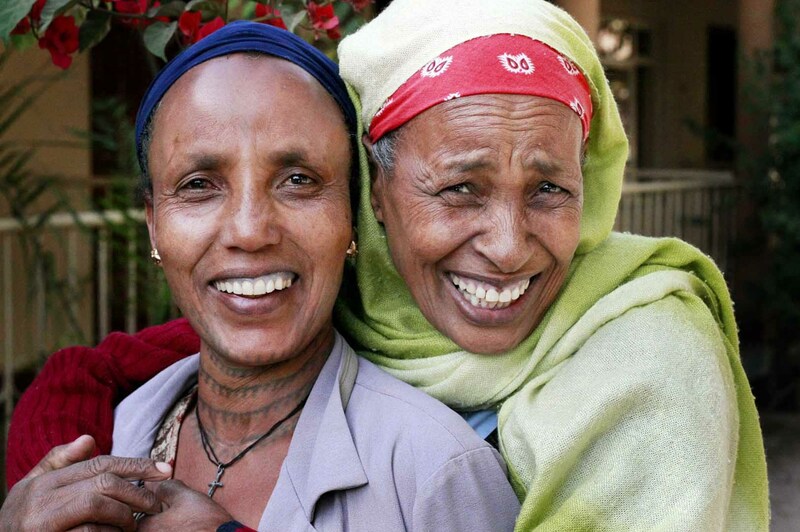 The joy and love reflected in their facial expressions warms the heart! Thank you for commenting Karen – they look like true friends don’t they? Hi Hariod, this is a fabulous photo. Full of laughter and fun. Amazing to think the poorest among us can laugh as they do. Blessings, Eve. True happiness and contentment are often found as blessings of the very poor. Thank you for your interest Dr. Rich; and yes, the requisites of the contented mind are but few. Should say I am actually shocked, my dear Hariod, by the caption. I should not be, I know that happiness exists at all levels. Thankyou, my dear Hariod, for the comment – I had meant no harm. The part of the caption that ‘shocked’ me was that they were ‘cleaning ladies.’ In India, these would be considered rather low in the social ladder. These two look quite Middle Class-ish! So, my comment is a mixture of love, compassion and admiration, that in the midst of poverty – that is how I see their lives, with all respect, of course – they radiate joy! Very happy for them, and very happy that you presented this joyful picture. Aha, I see your meaning now Yesudas, and must thank you for the clarification. I rather imagine that these lovely, radiant ladies work in a relatively wealthy residential household, where appearance would be a consideration, despite the physical demands of the tasks to be undertaken. In any event, we can rely upon Steve Evans, the photographer, for his accuracy in describing the ladies’ work status, I am certain. Many thanks for your revered presence once again dear Yesudas. Thank you, my dear Hariod, for writing all that. Actually I had not been very comfortable in having written my first comment. I knew I should have put it better. Love and regards to those good and lovely ladies, Steve Evans, yourself for sharing all that, and everybody! Thank you Elena, and may I say what a great pleasure it was last night to look through some of your wonderful work. I arrived at your place via Esme’s Cloud, in case you may have wondered. With all best wishes, Hariod. Thank you Jane, that’s very kind of you to say so, and Steve’s photo is one of my favourites too.